The more multisensory you make an activity, the more likely they are to retain the information. I made these in my classroom when I was a teacher, as many of my students had sensory processing difficulties. I would use duct tape to affix all sides to thick (cut) pieces of white poster board so I could whip them out any time I wanted to use them. This is a great activity for practicing pre-writing skills such as "down", "over", "around", etc., shapes, and even more advanced writing skills - like letters. In addition, it offers a great therapeutic/calming effect for some children and can be a sensory activity just for the sake of sensory. Mix it all together, put it on a piece of white paper, and start writing. Here my son is doing the "down" stroke. 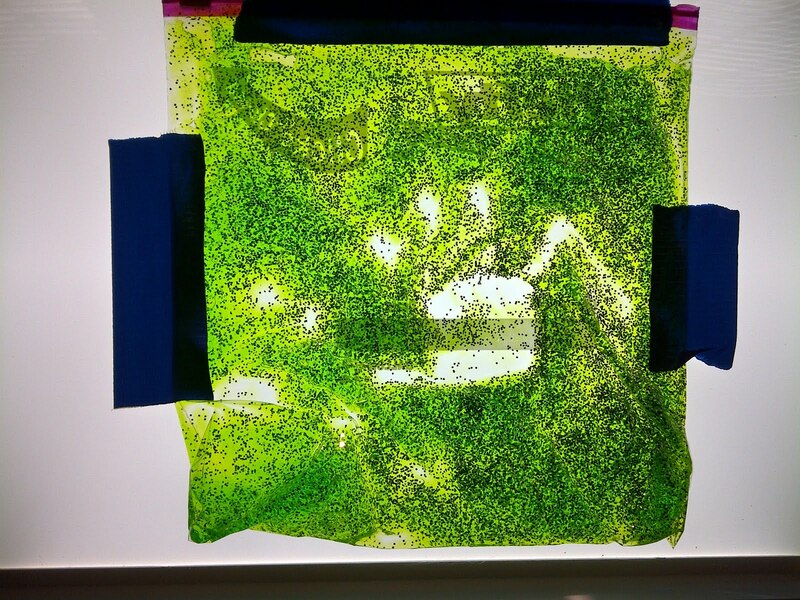 Here he is "making train tracks"
It was awesome on the light panel - here is my son's hand print. I also taped it down to stabilize it. Off to the dollar store! simple idea, but looks so fun! thanks for the inspiration! Perfect! Adding hair gel to my shopping list! Love your ideas and your blog. This particular one will be fabulous for my three year old who is beginning to write his letters by watching his four year old brother. Perfect for the light table in my JK classroom! Love it! Thanks! Jessica - When I had them in my classroom the lasted for a while - typically until they were destroyed, which could happen at any time depending on the day. Oh I love the addition of the light panel with the green gel! So cool! I love your posts - they make me really want a light table. i am in love with this idea! Can't wait to try it!! This is great! I also use this in my kindergarten classroom to help students write their letters, numbers, and sight words. Sometimes I will write the letter or sight word with a sharpie on the baggie before adding the gel. This way they can trace the letter with their finger! I love this idea. I'd love to include it in our local homeschool support group newsletter. Please let me know if I may do so. Made this today!! Can't wait to share with the daycare kids tomorrow. This is great! I'm going to make mine using a Food Saver bag (seal only). I think it will last much longer and one side of the bag is textured which will add to the sensory experience. I saw this on Pinterest and we tried it this morning. We used it a little differently. My girls decided to call it lava and they used their Strawberry Shortcake dolls to skate on lava. Thank you for sharing this idea. Here is a picture. I need to use more gel next time. I love this idea, it would be fun for "painting" on a long car ride. Must visit the dollar store! I made this with my 3 year old daughter today. Thank you for the great idea! I think this is such a cool, inexpensive, hands on approach to learning. I am currently studying to be an OTA, and I would love to use this for my demonstration speech in one of my classes. Would it be okay to do so? Thank you so much for the great idea. I have a 4 year old and she would love this toy. How did you keep the air bubbles out? def need the heavy duty ziplock bags! Can't wait to try this with my 2 boys! Thanks for the great ideas! Really this site is great! Excellent,super idea. Hi, wondering if you used 2 hair gel containers? I just made this and mine appears to have less in it than your pic. Also, I'm having a problem with air bubbles. Any tips? Thank you! I just used one bottle of hair gel. Perhaps your ziplock is bigger?? I also just pushed out the air as I closed the bag. Nice activity. Easy to set up and fun to experiment.